Weight management refers to the process of controlling and managing your weight through effective exercises and diet control. It involves the use of various weight loss methods and strategies to keep the weight of your body at the healthiest level. If you are one of the many people who are searching for the most effective weight loss program which is composed of solutions that work for quick weight loss, then you have to keep in mind that proper exercises and nutrition are among the most vital aspects of weight management. While others try surgery and medication as a means of achieving fast weight loss results, note that these are not sometimes safe so it is best if you stick to the natural methods of losing weight through establishing a healthy diet plan and performing regular exercises. The good thing about proper weight loss management is that it does not only maintain your healthy figure but it also allows you to prevent harmful health conditions before they ever strike. weight management certification course which can help you in becoming an expert in the field. Just make sure that you improve your skills in developing a reliable and effective weight management plan depending on whether your clients are underweight or overweight. You also have to improve your skills in finding the most suitable exercise for weight loss which can perfectly meet the specific needs of people. weight management certification will do. Brainmeasures is an online certification and employment testing company which has received extreme popularity and a lot of positive reviews at present because it is proven that all the certification courses and programs that it offers are high in quality, accurate and reliable. The weight management certification course from Brainmeasures can offer you a high quality fitness training which will surely raise your awareness about the specific procedures involved in effectively developing a weight management plan designed for individuals who wish to finally take complete control of their weight. It will also provide information about the best weight loss exercise for specific people and the major contributions of regular exercises and proper diet and nutrition in maintaining a healthy weight. After completing the Brainmeasures weight management certification course, it will be a lot easier for you to impart your knowledge about the field and assist people when it comes to achieving their weight loss goals. Speaking of weight loss, Brainmeasures also offers a Pilates certification course that equipes you with the skills to use the worldwide acclaimed exercise form of Pilates on your clients. 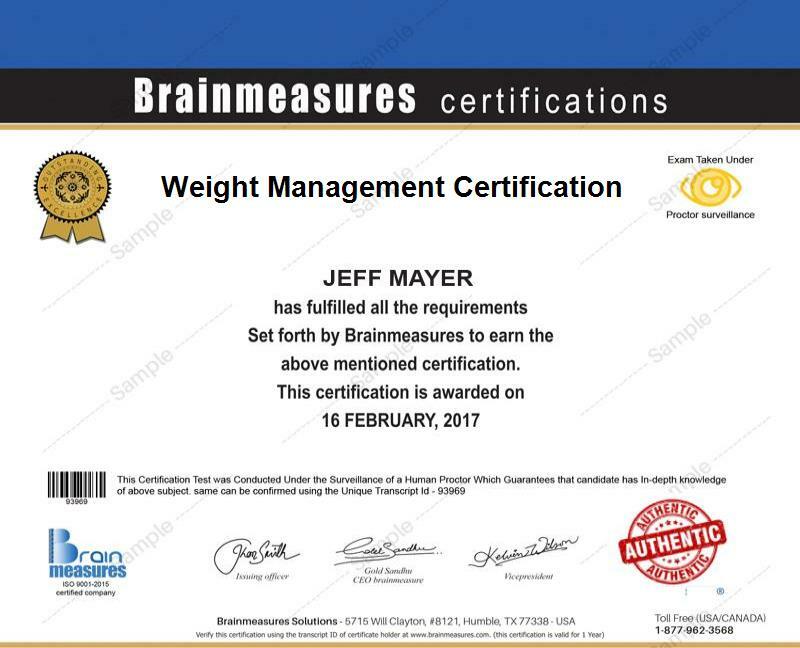 The weight management certification program which is now available at Brainmeasures is extremely beneficial to a wide array of professionals and individuals who are already aware of the importance of having a healthier weight when it comes to improving the quality of life. The weight management certification course is ideal for you if you want to completely understand all the strategies related to weight loss and weight control and management while also receiving the right tools and resources that can help you maintain a healthier weight and physique. The weight management certification course is also highly recommended for aspiring fitness professionals who want to supply their clients with relevant information about the best things that they can do to control their weight. Considering the huge number of jobs that will become available for you as soon as you complete your weight management certification course, it is also possible for you to get jobs with a high earning potential. Your earnings will actually be dependent upon your geographical location, the position that you hold, your employer and the specific industry which you are in. If you hold a weight loss managerial position, then your annual salary can start from $64,000. If you work as a nutritionist or dietician, then you average salary would be around $54,000 per year. Weight management consultants, on the other hand, earn around $78,000 annually.